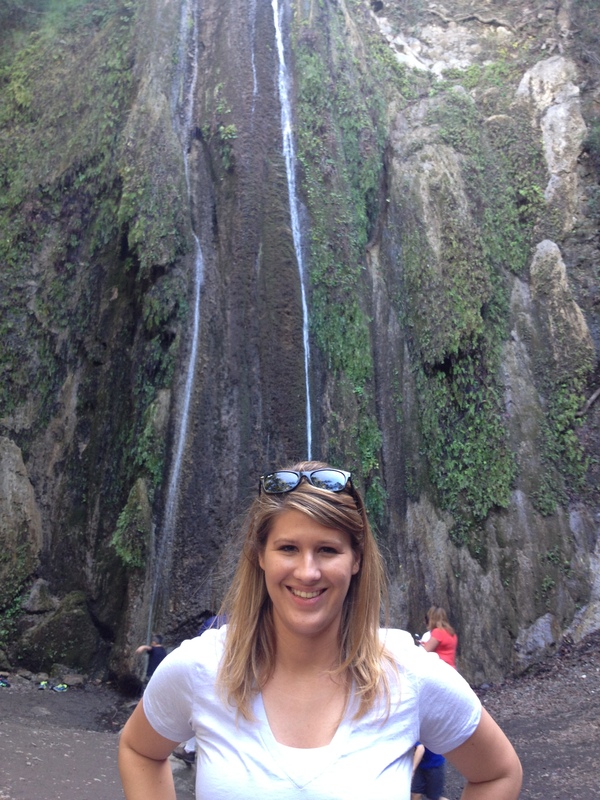 If you had asked me six years ago if I enjoyed hiking I probably would’ve given you a “are you serious?” look. Honestly I’m not even sure I went on a legitimate hike until my first true camping vacation in the great outdoors in the summer of 2008. I spent six days rafting down the Green River and Colorado River in Cataract Canyon and experienced my first challenging 1200 foot hike up to the Dollhouse. That hike was an incredible experience, full of rookie mistakes such as awful blisters and not bringing enough water, but I think it was a subtle turning point in my life where I connected more with nature. From then on I visited several Missouri State Parks and walked/hiked to some great sites, and my interest in hiking has only risen since my move to the beautiful state of California. 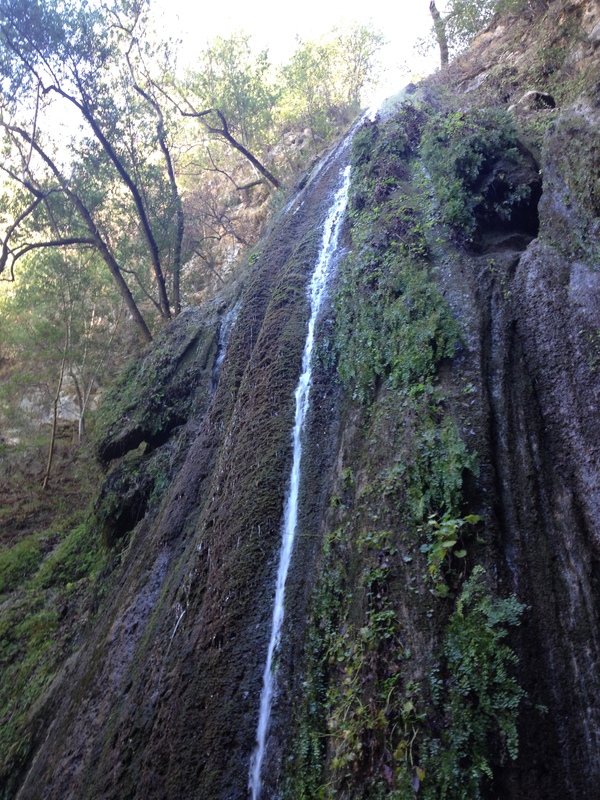 The Nojoqui Falls trail is a nice leisurely walk that is provides a lovely break for folks cruising on the 101 Freeway. 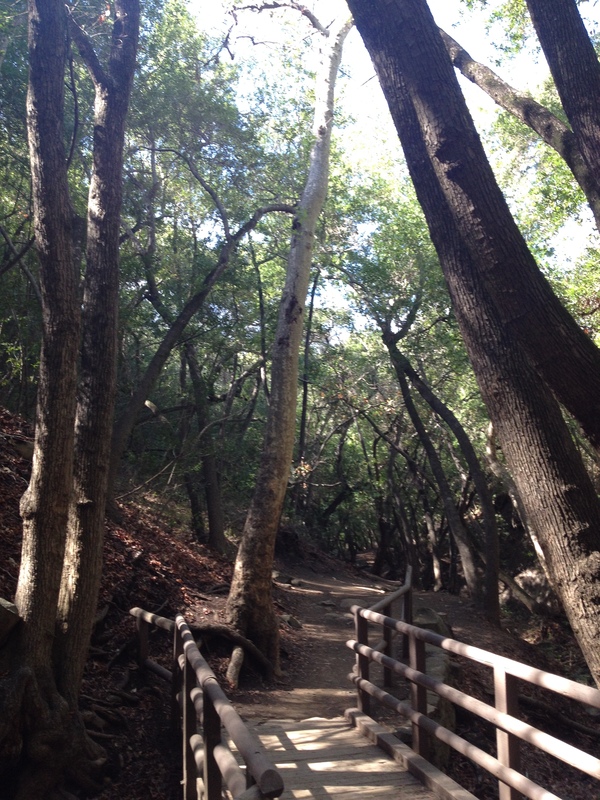 The trail is wonderfully shaded and great for all ages! 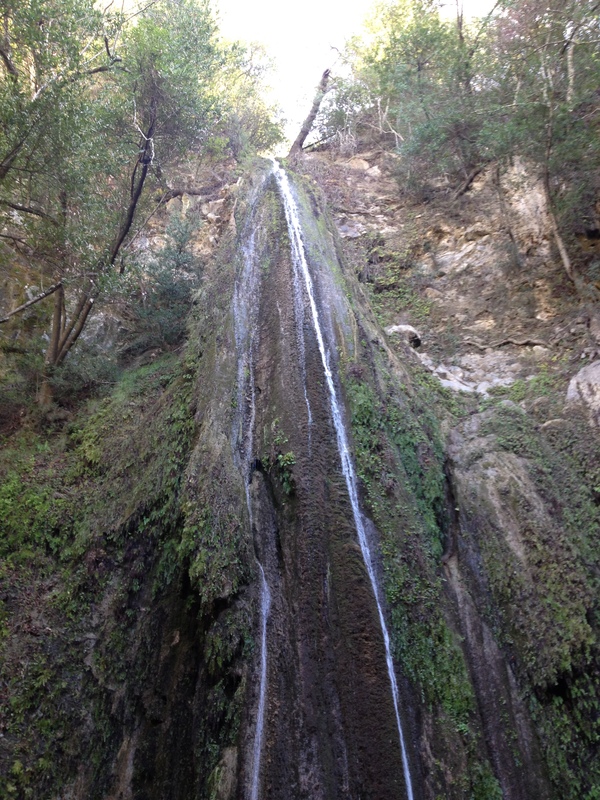 I want a reward for my hiking (no matter how easy the trail), and this is an awesome reward! Nojoqui Falls peaks in early Spring when the falls are the fullest, but water can be found year round. 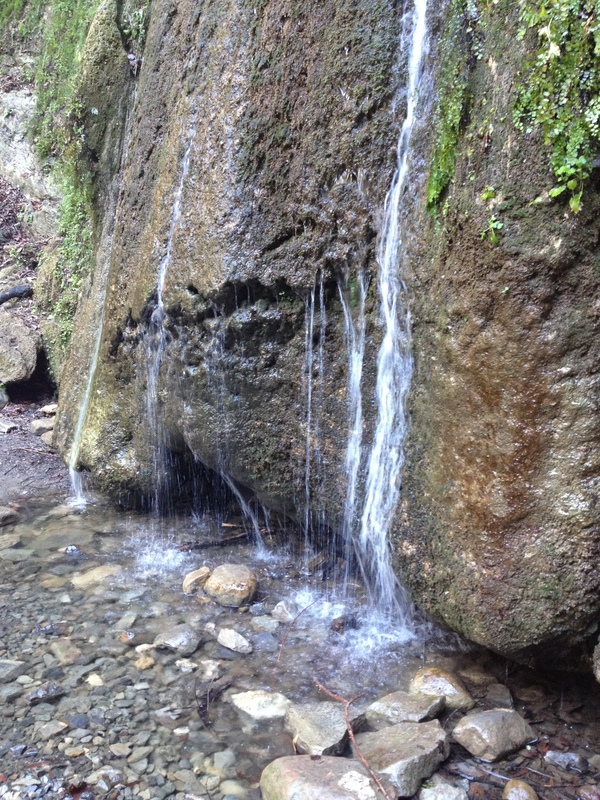 The waterfall wasn’t as full as it could be but still a steady stream of water. I bet the falls are an amazing sight after a heavy rainfall! Since this hike was more like a quick break to stretch our legs we decided to go on a second hike. 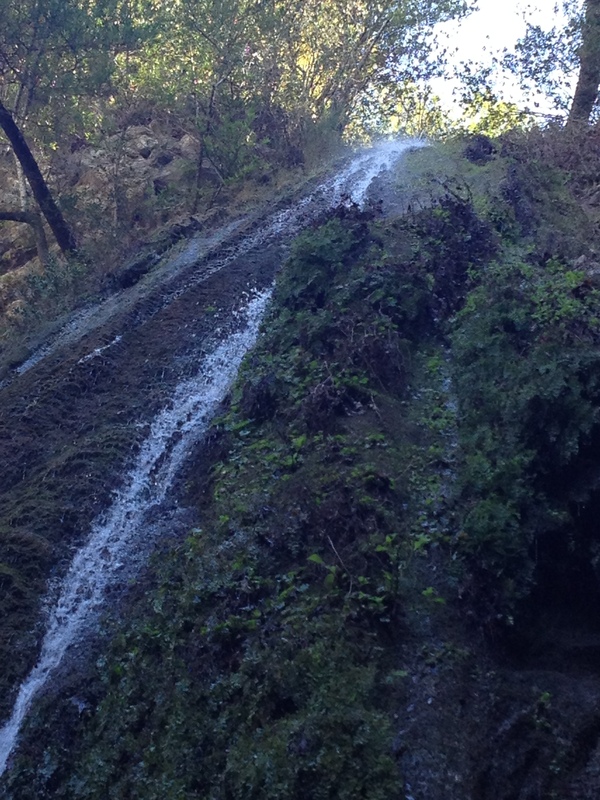 When we left Nojoqui Falls Park, we took the back roads to see where they went, instead of getting back on the highway. We figured we couldn’t get too lost and I rarely just cruise down back roads so it sounded like a fun little adventure. It was a beautiful and quiet drive through the back country of vineyards, equestrian ranches, and farms until we popped out at Solvang, a charming Danish town, nestled in the mountains. 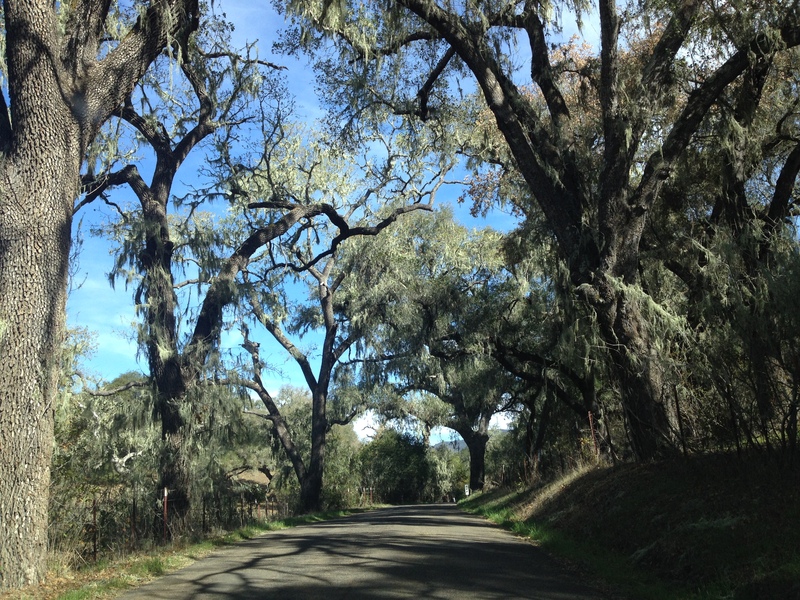 The drive felt like we were exploring the South! A wine tour in Solvang is on my bucket list! 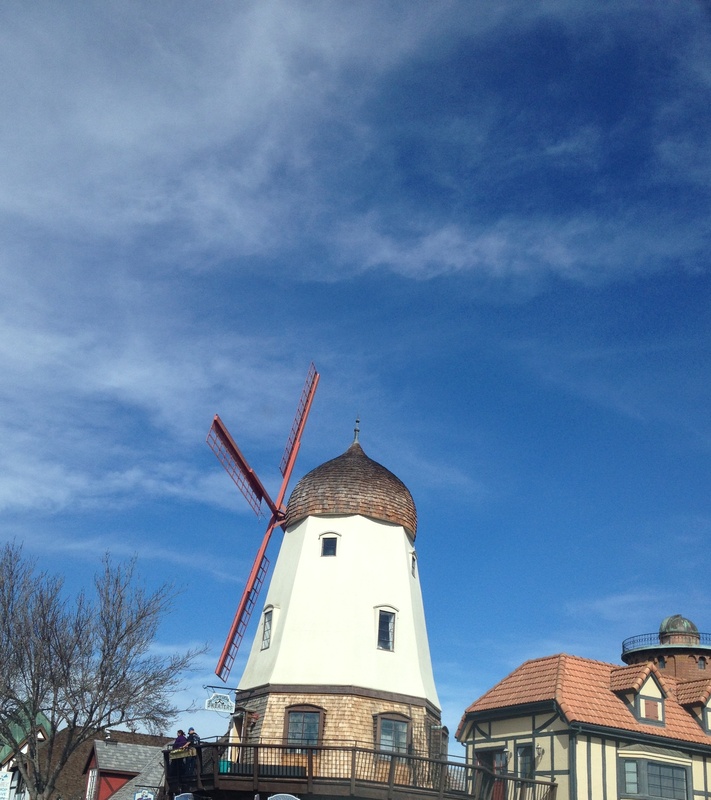 The Danish-styled architecture makes Solvang a charming and popular tourist destination. Now knowing where we were exactly, having reached Solvang, we continued our drive deeper into the Santa Ynez Mountains to our secluded destination of Knapp Castle. Thankfully we had looked up directions to this hike before we left, because the hike is not marked at all. When we turned off Route 154, we continued on for three, very long, miles that wound us up higher and higher into the Los Padres National Forest. The only indication we knew we arrived at the trail was a small pullout opposite of a gated trail. The trail is actually on private property, but the owners allow people to visit as long as they remain respectful. 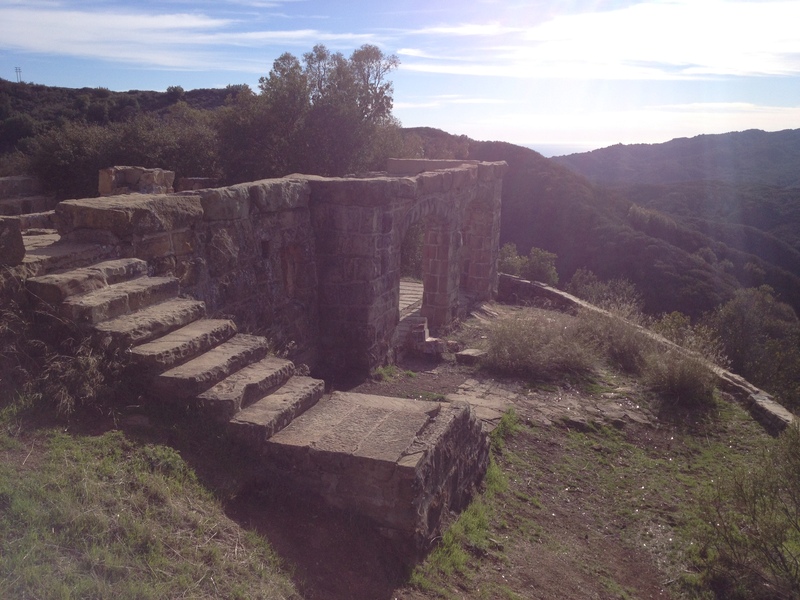 To reach Knapp’s Castle, take the unmarked dirt road with a gate and after about a quarter mile, turn right, passing through a gate to reach the ruins. Voilà! Although we were just above the mountains of Santa Barbara, this location felt so peaceful and serene and far removed from the city. From the drive in I knew this was going to be a gorgeous hike and the views right from the start are spectacular! 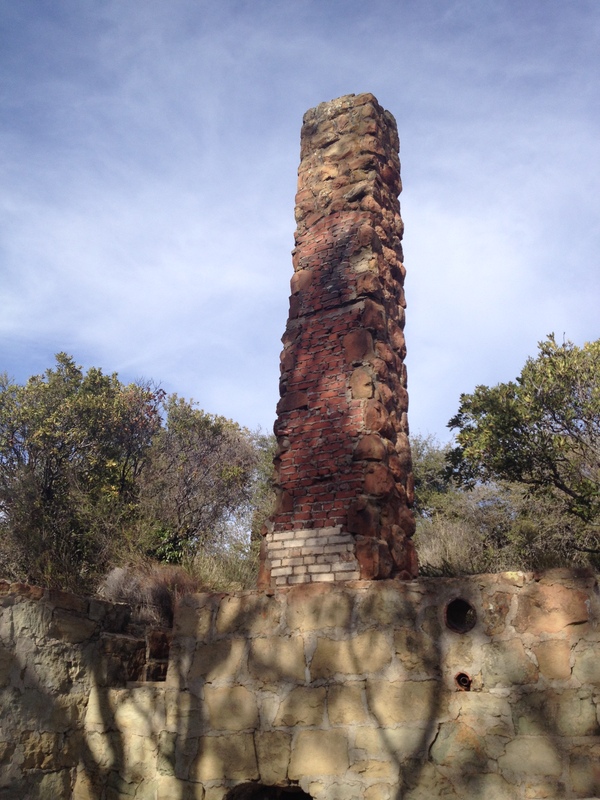 The hike round trip is about one mile and the mansion ruins are a fun area to explore and then rest while taking in the majestic views. Knapp’s Castle, was built in 1916 by George Knapp, but sadly burned down in 1940. Today the massive foundations, stone stairs, fireplaces, archways and some walls of the original structure remain enduring of this grand estate. 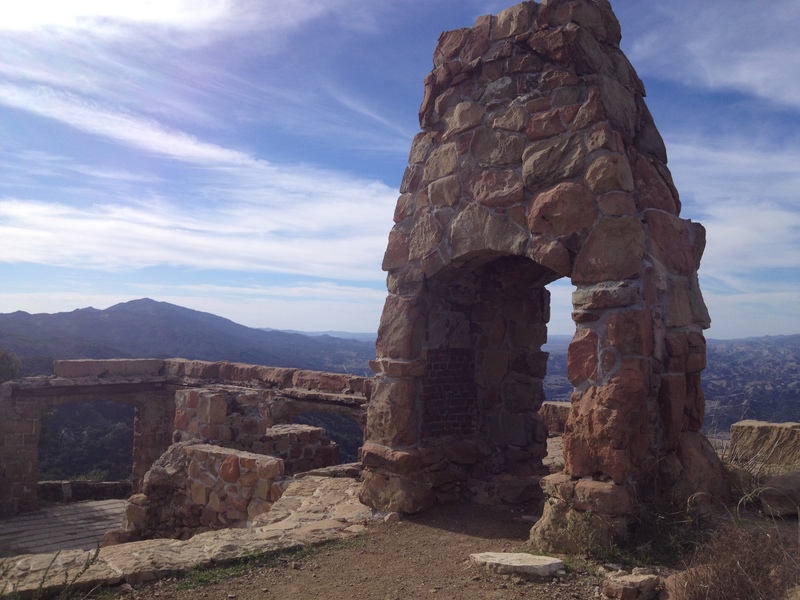 Knapp’s Castle sits nestled on a ridge in the Santa Ynez Mountains surrounded by the Los Padres National Forest. So much of my enjoyment of hiking is to experience off the grid activities and sites such as this. They sure don’t build fireplaces this huge anymore! 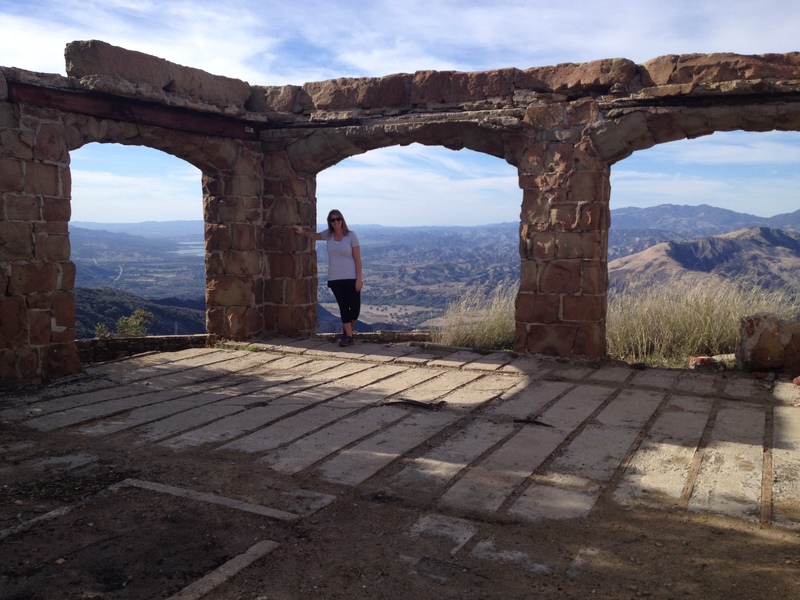 Knapp’s Castle offers a panoramic view of Lake Cachuma and the Santa Ynez Valley below. Looking through the archways Lake Cachuma is visible in the distance to the northwest. Interesting fact, that lake, which is a reservoir, did not exist when Knapp’s Castle was built or when it burned. 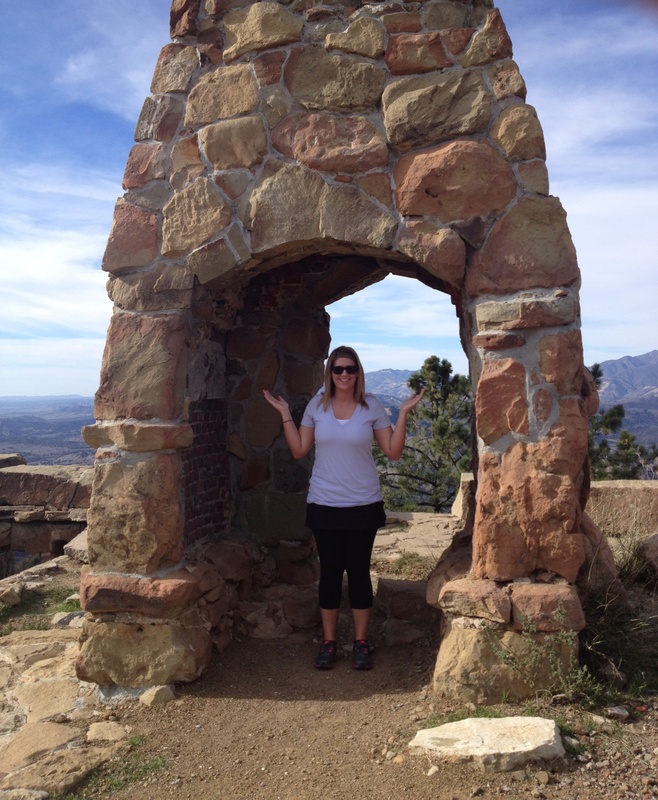 I found a little bit of my love of Greek and Roman culture at Knapp’s Castle! 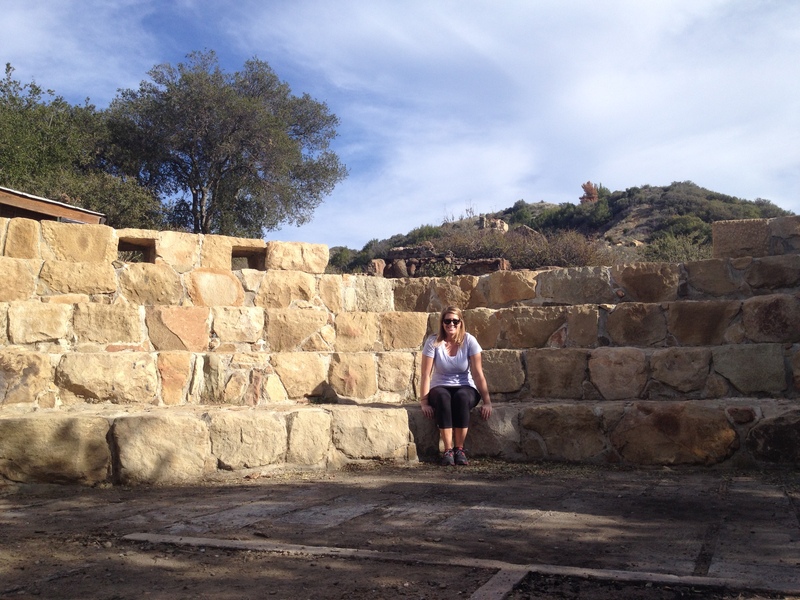 This stone amphitheater was an addition made in 2011 by the current owners before their construction was halted due to lack of proper permits. Another fireplace…we speculate this might be in the kitchen. It was fun and challenging to try and picture the layout of this mansion. It no doubt was a grand sprawling estate! A view of the other side of the archways and a stone staircase. 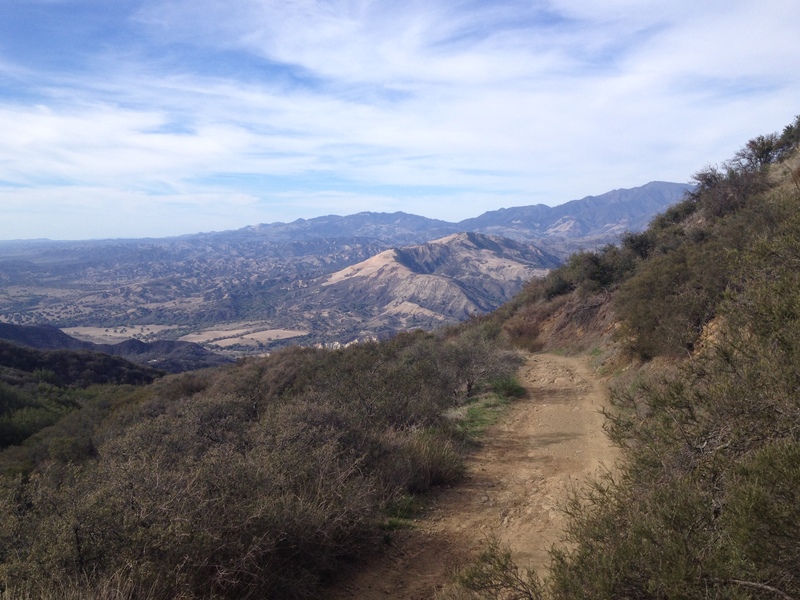 I highly recommend this hike because not only is it an easy hike, no strenuous or treacherous trails, but it offers some of the most beautiful views I’ve experienced in California. And those views in conjunction with the stone ruins of a once glorious mansion just add to the magical beauty of the site. I hope to discover many more secluded and breathtaking sites such as these and look forward to sharing them with you all! Let me know if you have any to share! A beautiful sunset in Santa Barbara to end the day! ← From mountains to desert!